Akureyri HI Hostel has been a part of the Hostelling International since it opened 1967. The Hostel has been run by the same family for all these years and they all share the same passion for the Hostel, to welcome travelers from all over the world and make them feel comfortable and enjoy their stay. 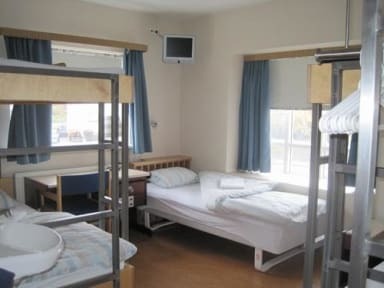 The Hostel offers many types of rooms; mixed dorm, single up to six person room. All rooms include; reading light over every bed, table and chairs, mirror, TV, hairdryer, free Wi-Fi and pillows & duvets. All rooms come with access to two well equipped kitchens and good dining rooms, TV room, free Wi-Fi and computer for those who need it. Akureyri H.I. reserves the right to change prices in view of tax changes. We offer discount tickets for; restaurant, whale watching, horse riding and river rafting. Nice kitchen. Big room for all the travelers. We have a really bad smell in the room, but only in our room. Not quite a nice stay there. People there are also cold.